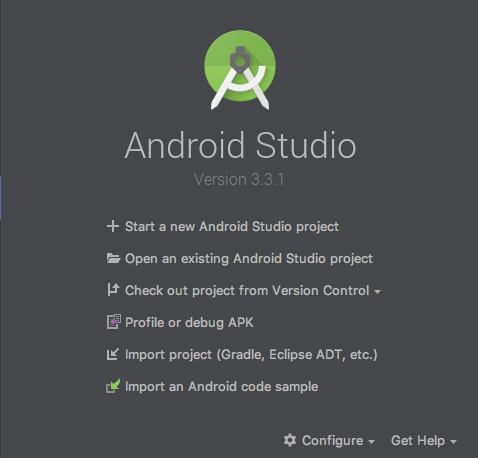 Update note: Aaqib Hussain updated this tutorial for Kotlin and Android Studio 3.3. Huyen Tue Dao wrote the original tutorial. 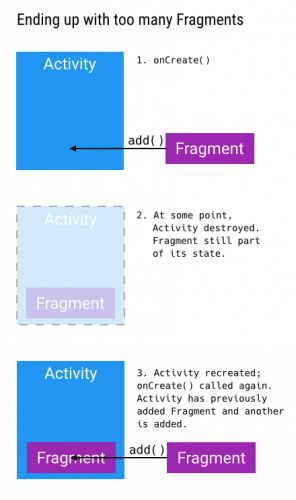 A fragment is an Android component that holds part of the behavior and/or UI of an activity. As the name would suggest, fragments are not independent entities, but are tied to a single activity. In many ways, they have functionality similar to activities. Imagine for a moment that you’re a super villain. You have a lot to do, so you might employ a few minions to run around and do your laundry and taxes in exchange for lodging and food. That’s kind of like the relationship between activities and fragments. Modularity: Dividing complex activity code across fragments for better organization and maintenance. Reusability: Placing behavior or UI parts into fragments that multiple activities can share. Adaptability: Representing sections of a UI as different fragments and utilizing different layouts depending on screen orientation and size. Create and add fragments to an activity. Let your fragments send information to an activity. Add and replace fragments by using transactions. Note: This tutorial assumes you’re comfortable the basics of Android programming and understand what the activity lifecycle means. If you’re brand new to Android, you should work through both the Android Tutorial for Beginners and the Introduction to Activities first. This tutorial utilizes an Android RecyclerView. If you’ve never used RecyclerView or need a refresher, you should also look at the Android RecyclerView Tutorial. Use the Download Materials button at the top or bottom of this tutorial to download and extract the Starter Project. In the Welcome to Android Studio dialog, select Import project (Eclipse ADT, Gradle, etc.). Check out the project El Dogo app. You’ll find some resource files: strings.xml, activity_main.xml, drawable and layout files. There are also some boilerplate layouts for your fragments, non-fragment code that you’ll need and a fragment class that you’ll use later to write your own. The MainActivity will host all of your wee fragments and DogListFragment contains code to display a list of dog breeds content so that you can focus on fragments. Build and run the project. You’ll see that it’s pretty quiet in there. But don’t worry! You’ll fix that…soon! Like an activity, a fragment has a lifecycle with events that occur when the fragment’s status changes. For instance, an event happens when the fragment becomes visible and active, or when the fragment becomes unused and is removed. You can also add code and behaviors to callbacks for these events as you would for an activity. onAttach: The fragment attaches to its host activity. onCreateView: A fragment creates its portion of the view hierarchy, which is added to its activity’s view hierarchy. onActivityCreated: The fragment’s activity has finished its own onCreate event. onStart: The fragment is visible. A fragment starts only after its activity starts and often starts immediately after its activity does. onResume: The fragment is visible and interactable. A fragment resumes only after its activity resumes and often resumes immediately after the activity does. onPause: The fragment is no longer interactable. This occurs when either the fragment is about to be removed or replaced or when the fragment’s activity pauses. onStop: The fragment is no longer visible. This occurs either after the fragment is about to be removed or replaced or when the fragment’s activity stops. 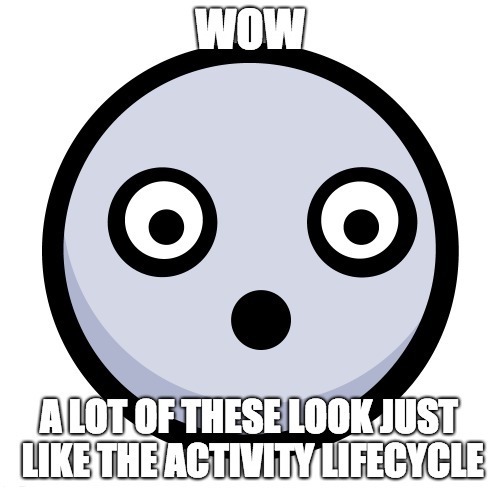 onDestroyView: The view and related resources created in onCreateView are removed from the activity’s view hierarchy and destroyed. onDestroy: The fragment does its final clean up. onDetach: The fragment is detached from its activity. As you can see, the fragment’s lifecycle intertwines with the activity’s lifecycle. But it has extra events that are particular to the fragment’s view hierarchy, state and attachment to its activity. In Android, when using fragments, there are two alternative fragment implementations you can use. One type is the fragment that is provided by the platform version. A platform version corresponds to the version of Android that a user is running. For example, a device running Android 6.0, SDK Version 23, would be running platform version 23 of the library. The second type is a support library fragment. When you include a support library, it is added to your project in the same manner as any third-party library. Using the support library has two benefits when developing applications for multiple versions of Android. First, it ensures that you have consistency in your code and functionality across different devices and platform versions. This means that bugs and fixes will be more consistent across different versions of Android using these libraries. Second, when they add new features to the latest version of Android, the Android team will often back-port these features via the support library in order for developers to use on older versions of Android. So, which library should you use? Android has deprecated platform fragments in Android 9.0, SDK Version 28. So you should always go with the v4 support library when using fragments. 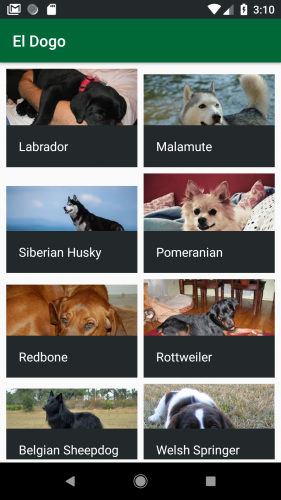 Eventually, El Dogo will show a list of dogs breeds on launch and tapping on any of the items will display details about that particular breed. To start, you’ll work backwards and first create the detail page. 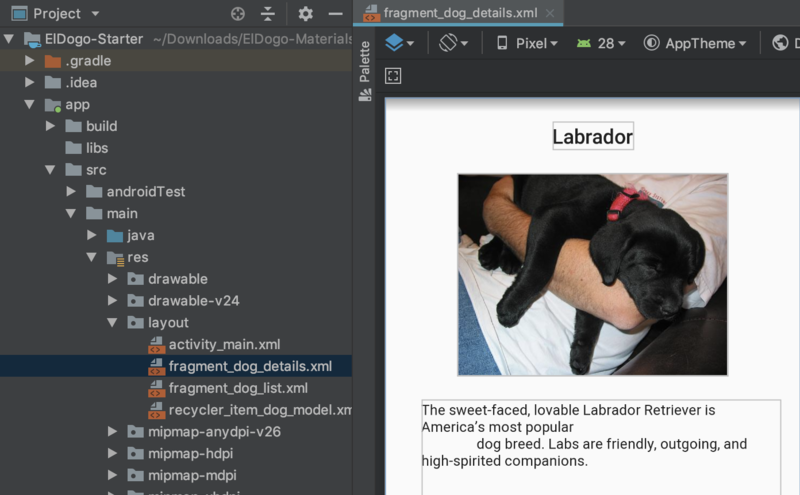 Open the starter project in Android Studio and find fragment_dog_details.xml under app ▸ src ▸ main ▸ res ▸ layout. This XML file lays out the dog detail display. It also displays one of the drawable resources and the associated String resources. Locate the DogDetailsFragment.ky file in the project. This class will be responsible for displaying details for a selected breed. Declares DogDetailsFragment as a subclass of Fragment. Notice the import android.support.v4.app.Fragment: This is from the v4 support library mentioned before. Provides a method for creating new instances of the fragment, a factory method. Creates the view for the fragment. Activities use setContentView() to specify the XML file that defines their layouts, but fragments create their view hierarchy in onCreateView(). Here you called LayoutInflater.inflate to create the hierarchy of DogDetailsFragment. The third parameter of inflate specifies whether the inflated fragment should be added to the container. The container is the parent view that will hold the fragment’s view hierarchy. You should always set this to false when inflating a view for a fragment: The FragmentManager will take care of adding the fragment to the container. There’s a new kid in town here: FragmentManager. 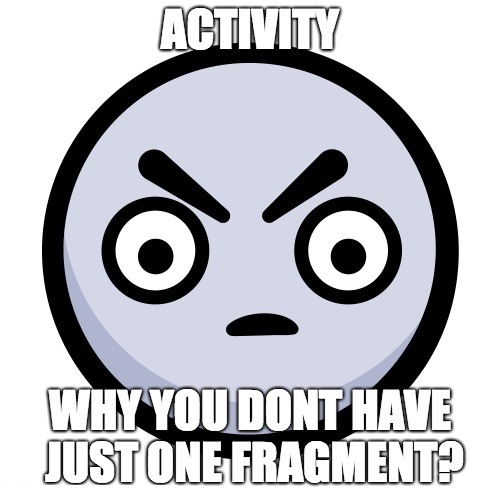 Each activity has a FragmentManager that manages its fragments. It also provides an interface for you to access, add and remove those fragments. You’ll notice that while DogDetailsFragment has a factory instance method, newInstance(), it does not have any constructors. 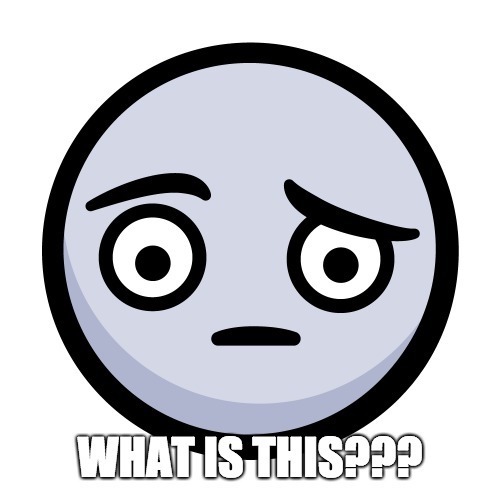 Wait, why do you need a factory method but not a constructor? First, because you did not define any constructors, the compiler automatically generates an empty, default constructor that takes no arguments. This is all that you should have for a fragment: no other constructors. Second, you probably know that Android may destroy and later re-create an activity and all its associated fragments when the app goes into the background. When the activity comes back, its FragmentManager starts re-creating fragments by using the empty default constructor. If it cannot find one, you get an exception. For this reason, it is best practice to never specify any non-empty constructors. In fact, the easiest thing to do is to specify none as you did here. What if you need to pass information or data to a Fragment? Hang on, you’ll get the answer to that later! Here’s where you get to add a fragment using the simplest approach — adding it to the activity’s XML layout. This is also sometimes called Adding a Fragment Statically. Note: You could also use android:name="com.raywenderlich.android.eldogo.DogDetailsFragment" instead of class="com.raywenderlich.android.eldogo.DogDetailsFragment". In this step, you’re placing a <fragment> tag inside of the activity layout and specifying the type of fragment the class attribute should inflate. FragmentManager requires the view ID of the <fragment>. 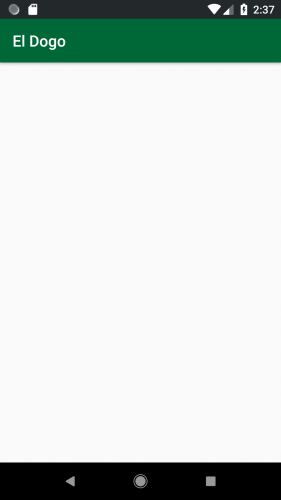 By including this in the XML, the FragmentManager knows to add this fragment to the activity automatically. First, open activity_main.xml again and remove the <fragment> you inserted. Embrace the Zen of deleting code! You’ll replace it with the list of dog breeds. Open DogListFragment.kt, which has all the list code. You can see that the DogListFragment has no explicit constructors and a newInstance(). The list code in DogListFragment depends on some resources. You have to ensure that the fragment has a valid reference to a Context for accessing those resources. That’s where onAttach() comes into play. The GridLayoutManager helps in positioning items in the breed list. The other import is for standard fragment overrides. // Get dog names and descriptions. onAttach() contains code that accesses the resources such as breed names and descriptions you need via the Context to which the fragment is attached. Because the code is in onAttach(), you can rest assured that the fragment has a valid Context. In onCreateView(), you inflate the view hierarchy of DogListFragment, which contains a RecyclerView, and perform some standard RecyclerView setup. If you have to inspect a fragment’s view, onCreateView() is a good place to start because it generates the view. At this point, to get DogListFragment into MainActivity. You ask your new friend, FragmentManager, to add it. Check that the savedInstanceState is null. This is a way to see if it’s an initial open of the screen. Grab the FragmentManager by referencing supportFragmentManager as opposed to fragmentManager, since you are using support fragments. Ask that FragmentManager to start a new transaction by calling beginTransaction() — you probably figured that out yourself. The view ID of a container for the fragment’s view hierarchy in the activity’s layout. If you take a look at activity_main.xml, you’ll find @+id/root_layout. The fragment instance you want to add. A string that acts as a tag/identifier for the fragment instance. This allows the FragmentManager to later retrieve the fragment for you. Finally, ask the FragmentManager to execute the transaction by calling commit(). The lesson: Always keep in mind how the saved state affects your fragments. And with that, you’ve added the fragment! FragmentManager helped achieve this awesomeness through FragmentTransactions, which are basically fragment operations such as add and remove. A data section in the recycler_item_dog_model.xml layout file. Let’s take a quick walkthrough. The problem with that is that if you change the value of name for programmer, you would need to do a subsequent setText to the TextView in order to update the item. Imagine having a tool where you could bind a variable from your fragments and activities to your view and allow for changes to the variable to automatically update in the View. That is what data binding does for you. Looking at our El Dogo app, the enabled=true in the build.gradle enables data binding in the application. Your data class contains data that you want to use in your fragment and display in your view. The data field contains variables consisting of name and type options which specify the type and name of the variable being bound. Now that you have your view set up, you need to access your view and bind the variables to it. This is where the data binding magic comes in! You can then inflate the view via the inflater method on the binding object and set properties via standard property access mechanisms. View Model/Binder: The auto-generated binding files. For further reading on the MVVM, and other design patterns, refer to the tutorial Common Design Patterns for Android. You’ll see more on data biding later on. Even though fragments attach to an activity, they don’t necessarily all talk to one another without some further encouragement from you. For El Dogo, you’ll need DogListFragment to let MainActivity know when the user has made a selection so that DogDetailsFragment can display the selection. This defines a listener interface for the activity to listen to the fragment. The activity will implement this interface and the fragment will invoke the onDogSelected() when the user selects an item, passing the selection to the activity. This field is a reference to the fragment’s listener, which will be the activity. This initializes the listener reference. Wait until onAttach() to ensure that the fragment actually attached itself. Then verify that the activity implements the OnDogSelected interface via is. If it doesn’t, it throws an exception since you can’t proceed. If it does, set the activity as the listener for DogListFragment. Note: Now you can remove the if (context != null) line in onAttach() if you like. Okay, I lied a little: The DogListAdapter doesn’t have everything you need! In the onBindViewHolder() method in DogListAdapter, add this code to the bottom. This adds a View.OnClickListener to each dog breed so that it invokes the callback on the listener, the activity, to pass along the selection. You will get an error asking you to make MainActivity abstract or implement the abstract method onDogSelected(dogModel: DogModel). Don’t fret yet, you’ll resolve it soon. This code specifies that MainActivity is an implementation of the OnDogSelected interface. Now you’ve got the activity and its fragments talking. You’re like a master digital diplomat! Currently, DogDetailsFragment displays a static Drawable and set of Strings. But what if you want it to display the user’s selection? This is almost the same as the layout was before except with data binding added. At the top you’ll see that you’ve added a variable for our DogModel. The text for name and description is bound to the variables of the same name in the DogModel object. Then, you’re using this variable to set values on the views. This corresponds to a binding adapter in the DataBindingAdapters.kt file. A binding adapter allows you to perform actions on an element which are not supported by default data binding. In your case, you are storing a resource integer for the image to display, but data binding does not provide a default way to display an image from an ID. To fix that, you have a BindingAdapter that takes a reference to the object from which it was invoked, along with a parameter. 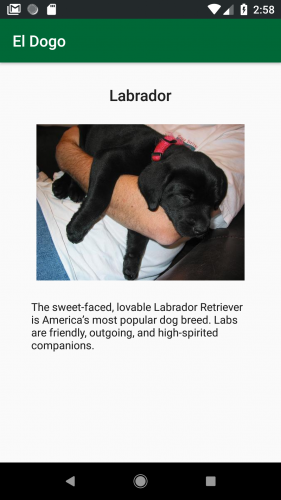 It uses that to call setImageResource on the imageView that displays the image of the dog. private const val DOGMODEL = "model"
A fragment can take initialization parameters through its arguments, which you access via the arguments property. The arguments are actually a Bundle that stores them as key-value pairs, like the Bundle in Activity.onSaveInstanceState or the Activity extras from intent.extras. You create and populate the arguments’ Bundle, set the arguments and, when you need the values later, you reference arguments property to retrieve them. As you learned earlier, when a fragment is re-created, the default empty constructor is used— no parameters for you. Because the fragment can recall initial parameters from its persisted arguments, you can utilize them in the re-creation. The above code also stores information about the selected breed in the DogDetailsFragment arguments. Inflate the view using FragmentDogDetailsBinding. Since you want to dynamically populate the UI of the DogDetailsFragment with the selection, you grab the reference to the FragmentDogDetailsBinding. Get the DogModel from the arguments. Next, you bind the view dogModel with the DogModel that you’ve passed to DogDetailsFragment. Create a fragment instance that includes some nifty parameters. Call replace(), instead of add, which removes the fragment currently in the container and then adds the new Fragment. Call another new friend: the addToBackStack() of FragmentTransaction. Fragments have a back stack, or history, like Activities. 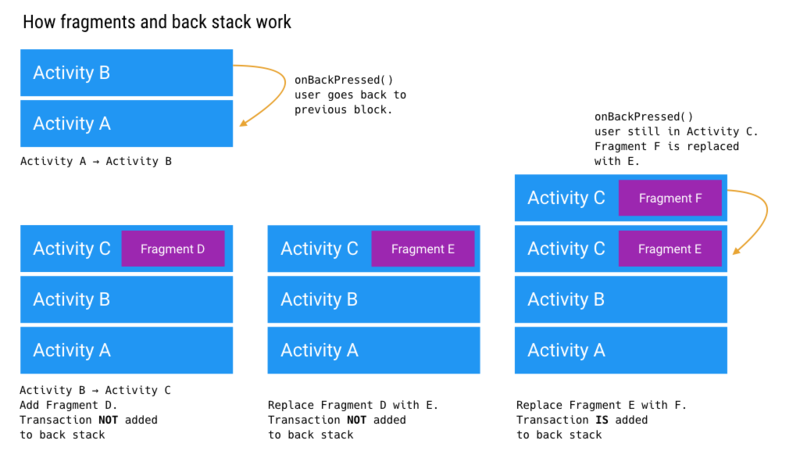 The fragment back stack is not independent of the activity back stack. Think of it as an extra stack of history on top of that of the host activity. When you navigate between activities, each one gets placed on the activity back stack. Whenever you commit a FragmentTransaction, you have the option to add that transaction to the back stack. So, what does addToBackStack() do? It adds the replace() to the back stack so that when the user hits the device’s back button it undoes the transaction. In this case, hitting the back button sends the user back to the full list. The add() transaction for the list omits calling addToBackStack(). This means that the transaction is part of the same history entry as the entire activity. If the user hits the back button from the list, it backs the user out of the app. With that you’re done! 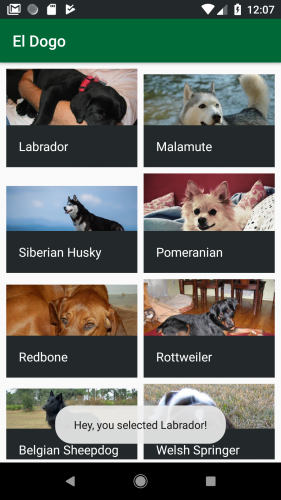 You now have an app El Dogo that displays details about the dogs breeds. You can find the Final Project for this tutorial by clicking the Download Materials button at the top or bottom of this tutorial. There is a lot more to learn and do with fragments. Like any kind of tool or feature, consider whether fragments fit your app’s needs and, if they do, try to follow best practices and conventions. Use a more powerful, advantageous DialogFragment instead of a plain vanilla dialog or AlertDialog. Play with how fragments interact with other parts of an Activity, like the app bar. Create adaptive UIs with fragments. In fact, you should run through Adaptive UI in Android Tutorial. Use fragments as part of the implementation of a high-level behavioral architecture. 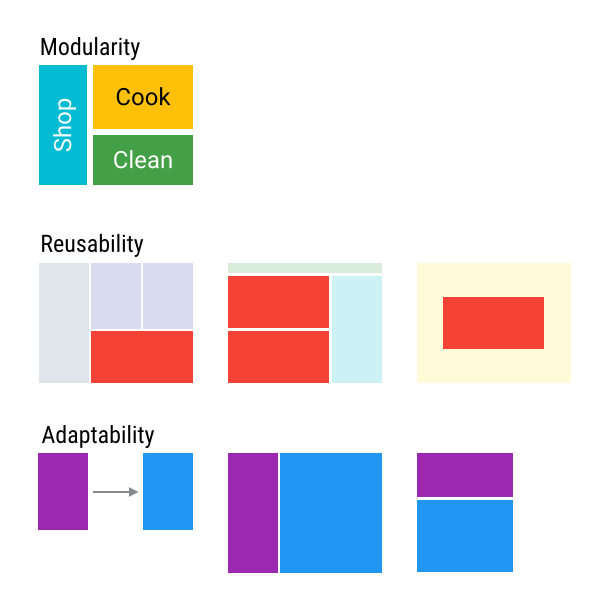 You can take a look at Common Design Patterns for Android as a good starting point to get the architecture ball rolling. To learn more about Data Binding check this reference. We hope that you’ve enjoyed this tutorial. If you have any questions or comments, please join the forum discussion below!